Actually, this post from 2009 was originally called Happy Valentine's from Tattoosday! But, it's the 13th, so we can't really use the same title now, can we? Lacking any new material for this holiday o' love, I'm re-posting an old favorite that seems to be in the theme. Well, at least there's a heart in it. Cait and her friend Michelle have birthdays two days apart. 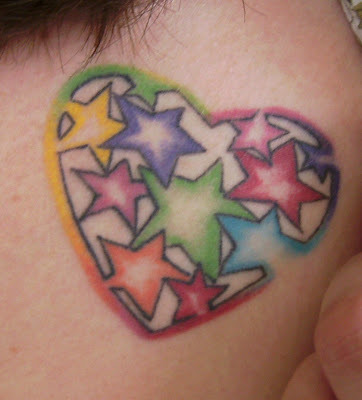 When they turned 18, they took a design that Michelle had crafted to Da Vinci Tattoo Studio in Wantagh, New York. The artist she remembered as "Yoshi" inked matching pieces for the two. Here's hoping the day is everything you expect it to be! This entry is ©2008-2009, 2013 Tattoosday.